Mirror photo by Patrick Waksmunski Penn State freshman kicker Vlad Hilling of Hollidaysburg talks with coach James Franklin after a kick. 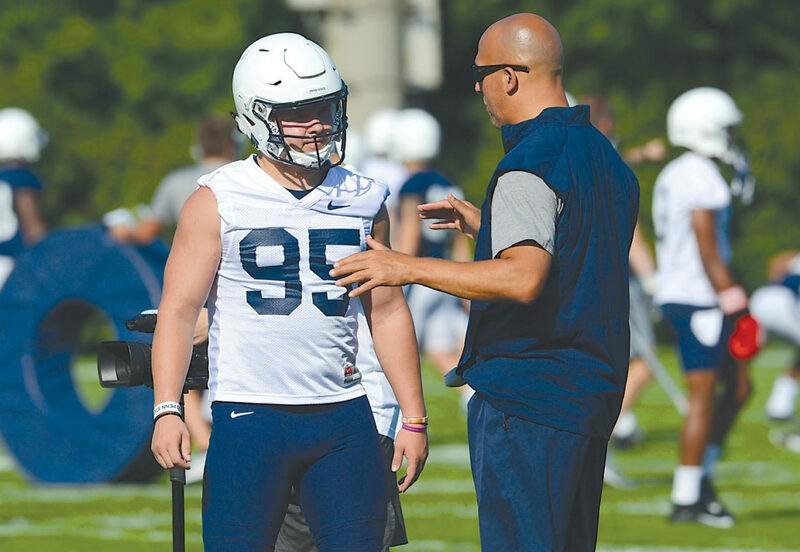 UNIVERSITY PARK — Linebacker Manny Bowen is back on the Penn State team, which was the biggest football news of media day, but coach James Franklin actually stole the show by doing something rather, um, cheeky. Franklin made national news when he showed off some bruises he got during the football team’s recent paintball outing. He lifted up his shirt at one point to show bruises, then pulled up his shorts and revealed a large bruise on the upper back portion of his left leg. Cameras caught the comical and bizarre sequence, and pictures of Franklin quickly made the rounds on the Internet. Franklin finally confirmed what had been rumored all summer with regards to Bowen, saying the senior has been reinstated to the team. His role with regards to playing this season, however, has not been determined. Bowen was kicked off the squad prior to the Fiesta Bowl last season for violating unspecified team rules. He also was suspended before the Rose Bowl two seasons ago. 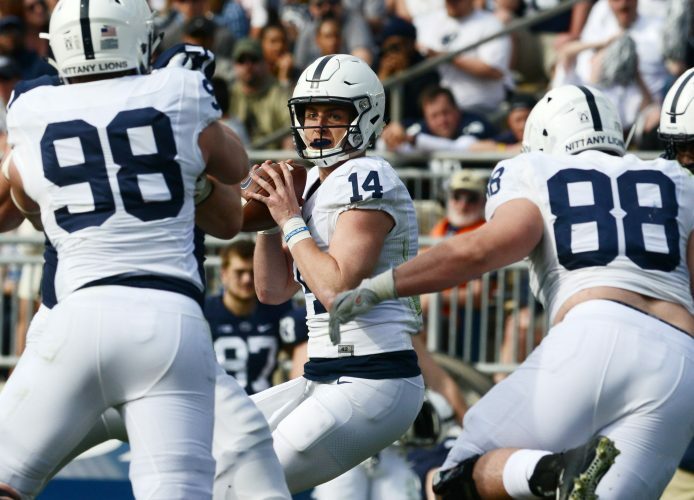 Penn State has a major need at middle linebacker, and Bowen certainly could fill that. But one thing Franklin stressed was that he would not make disciplinary decisions based on football needs. “I don’t want any decisions that we make be a need-based,” Franklin said. “I also don’t want decisions that we make be an influence because of the perception of it. I want to do things because they are the right things to do. Bowen is scheduled to graduate in December, and Franklin wanted to do what he could to help keep him around so he could get to graduation. “I can’t tell you what his role on the team is going to be like,” Franklin said. “To be honest with you, I have no idea. But I do think the plan in place was the right thing to do for Manny and gives him the best opportunity in December for him to graduate from Penn State. Everything else is icing on the cake. Simpson is a redshirt junior with eligibility through 2019. Hoenstine is a redshirt freshman in his second year in the program. The Lions don’t have a starting place-kicker yet, and training camp will feature what likely will be a stiff competition between five guys. The coaches don’t seem to want punter Blake Gillikin to also handle place-kicking duties, so it will come down to five others for the job. One of them is Hollidaysburg Area High School product Vlad Hilling, a freshman walk-on. “One of his strengths is he has a very strong leg, which was evident in seeing him kick the field goals and the field goal he made in the Big 33 game,” special teams coordinator Phil Galiano said. “One of his other strengths is Vlad is a phenomenal young man, and he is a guy that’s very comfortable and pressure doesn’t get to him.